Most car owners may have heard about a cambelt, but hardly anyone is aware of what it is and how it affects a vehicle’s functioning. Cambelt, also known as timing belt, is an extremely crucial part of any car’s internal combustion system. It coordinates the rotation between the crankshaft and camshaft. It makes sure that different valves of an engine open and close at the same time with the intake and outtake strokes of each cylinder. Hence, it helps an engine to function efficiently. At Easington Service Station, we realise the importance of a cambelt for the proper functioning of a car. We are considered one of the best service garages in and around Easington, Saltburn-by-the-Sea and Cleveland. Hence, if you require a time belt replacementinEasington, you can come to us, and we will change it in no time. The first use of a cambelt was in 1945. Subsequently, in 1950 Bill Devin built a new engine for a racing car, using a spiked rubber belt. This new breed of racing car won the SSCA National championship in 1956. Since then, cambelts have come a long way; it has become extremely complex and intricate. However, unfortunately, there are times when it starts to malfunction, and a cambelt replacement in Easington is needed. If there is too much smoke coming out from the tailpipe than the usual amount, it may be a problem with the cambelt. Every cylinder has two shafts which let in air and release exhaust. There is a synchronised movement of each cylinder with the rotation of the camshaft. A worn out time belt makes this process unsynchronised, letting in air and letting out the exhaust at inappropriate times. Thus, it results in more smoke coming out from the tailpipe. In such cases, there arises a need for a cambelt replacement in Easington. 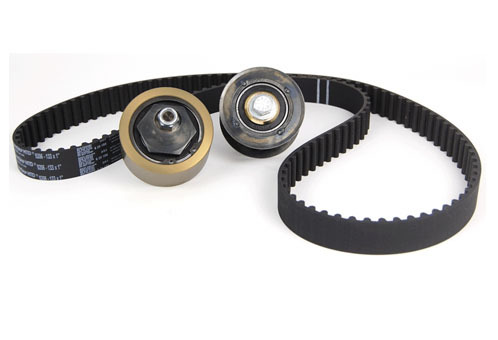 Acambelt aids in the spinning of the camshaft. If its timing is off, it may break pieces of the camshaft, and they might fall into the oil valve. Therefore, it results in a reduction of oil pressure at the engine bottom. That might cause an engine to fail, and the only way to fix it is to replace the entire motor. If you see such symptoms, it might be due to a broken cambelt. Come down to our garage, and we will replace it and all at affordable the most affordable rate. You can bring your car to our garage from 8:30 AM to 5 PM on weekdays and till 2 PM on Saturdays.